This exclusive coverage for film production professionals works for both large film production companies and boutique videographers. Provide Certificates of Insurance and add Additional Insureds with General Liability. This coverage is often required by locations, cities, states, or film permit offices. General Liability insurance protects against lawsuits claiming bodily injury or property damage to third parties. We know that every film production is different. That’s why RVNA Production Insurance’s Property/Equipment coverage has over 20 optional coverages including miscellaneous equipment, office equipment, money & currency, extra expense, power interruption, agency reshoot, third party property damage, negative film, faulty stock, and many more! Pick and choose the coverages and limits you want to meet your unique needs. Are you renting a vehicle for your productions? RVNA Production Insurance offer’s Non-Owned and Hired Automobile Liability which protects your film production company for sums you become legally obligated to pay due to Bodily Injury or Property Damage resulting from the use of non-owned and hired automobiles including rented or borrowed vehicles and vehicles owned by others. Is your film shoot location asking for higher limits? Excess Liability is available to increase your General Liability and Non-Owned and Hired Automobile Liability limits to meet your location requirements. Errors & Omissions insurance protects film producers from lawsuits that allege infringement of copyright, libel or slander, invasion of privacy, plagiarism or unauthorized copying of ideas, defamation or degrading of products (trade libel), and infringement on title, slogan, or trademark. Do you have employees? Workers Compensation protects your film production company by providing statutory insurance protection for an employer’s exposures arising out of injuries sustained by employees. Wondering what coverages you need for your Film Production? Just ask. Call us at 1-800-364-2433 or visit RVNA Production Insurance. 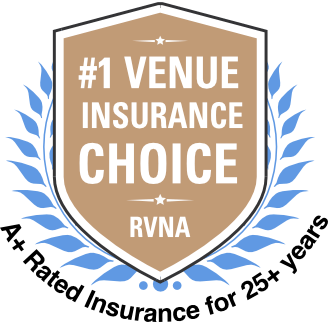 RVNA’s Production Insurance is the only production insurance available to quote and purchase online 24/7. [RVNA] CRUSHED it. This was my first time working on an actual film and dealing with insurance. I literally had ZERO idea of what I was doing prior to reaching out to RV Nuccio & Associates. [The representative] was SUPER friendly and incredibly understanding and walked through everything immediately. She turned this from a panic-stricken nightmare into a dream project. Provided everything goes well on THIS shoot, this will mark the beginning of a long-term relationship. Thank you again!! !